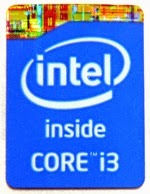 The Intel Core i3-4010U is an ultra low voltage dual-core processor for laptop PC. It is fabricated using the 22 nanometer technology. It features Hyper-Treading technology, where the two cores can process up to four threads in parallel, which makes improved utilization of the processor. Each core of this ultra - low - voltage processor offers a clock speed of 1.7 GHz, since this belongs to Core i3 series this does not offer Turbo Boost technology. 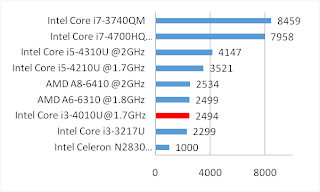 Compared to other CPU this Core i3-4010U (PassMark = 2494) is as powerful as AMD A6-6310 with a PassMark Score of 2499, and AMD A8-6410 with a score of 2534 points, and slightly better than the old and slightly higher clocked Intel Core i3-3217U with a score of 2299. This CPU, on the other hand is less powerful than the Intel Core i5-4210U with 3521, Intel Core i5-4310U with a score of 4147, Intel Core i7-4700HQ with 7958 and Intel Core i7-3740QM with score of 8459. 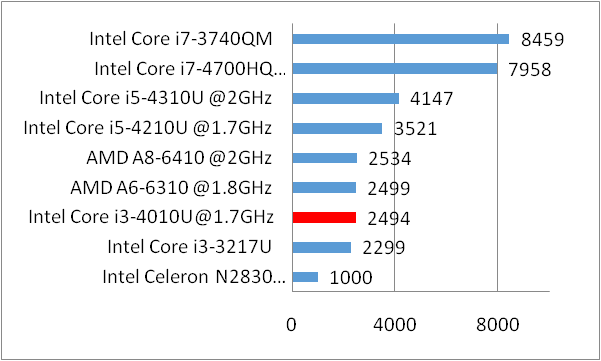 Below is a graph showing the performance of i3-4010U compared to other processors. It has integrated graphics processing controller called HD Graphics 4400 that offers 20 Execution Units which is clocked at the range of 200 - 1000 MHz with Turbo Boost technology, which makes it better than the older Intel HD Graphics 4000 at similar clock speeds. Nevertheless, this Intel HD 4400 graphics controller is a bit slower than its sibling, the Intel HD Graphics 5000. The Core i3-4010U, on the other hand) has a thermal design power (TDP) of 15 Watts, this includes the graphics card, memory controller, VRMs and the integrated chipset. With this thermal design power, this CPU is designed for small notebooks PCs with sizes ranging from 11 inches and above. Laptop PC with this CPU include HP-15-r015dx touchscreen notebook with 15.6-inch display.